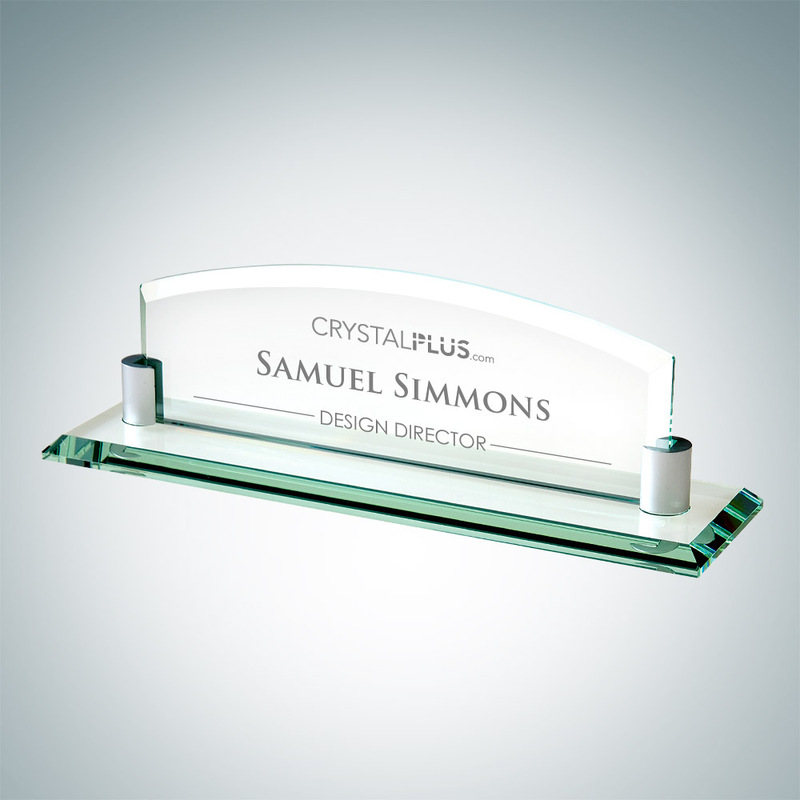 The Jade Glass Nameplate with Chrome Holder are the ideal gift for office. 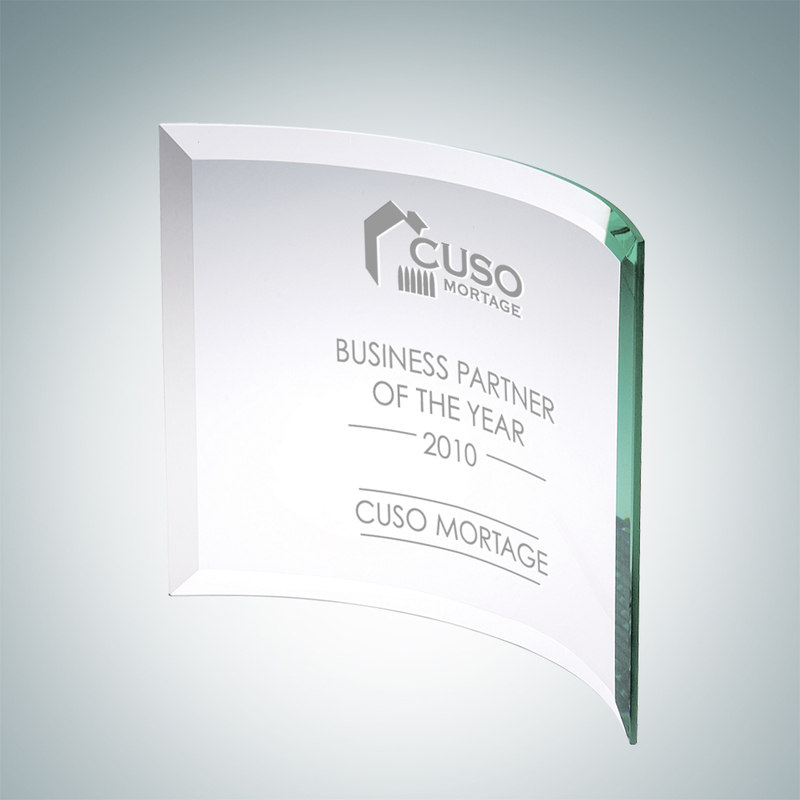 It has a screw on chrome square or star of your choice, Available in both Chrome holder and Brass Holder.. 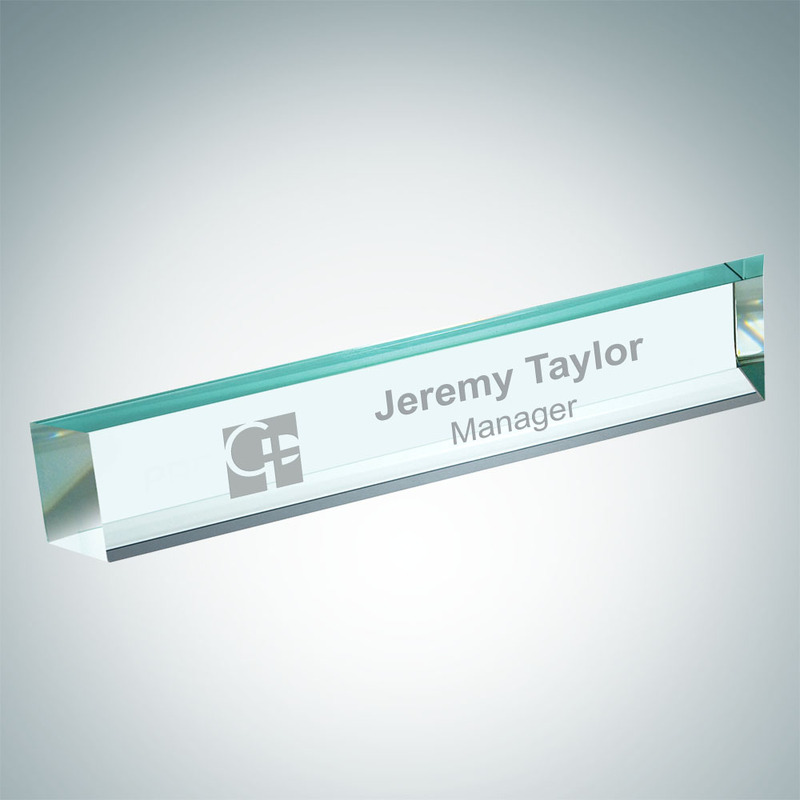 The Jade Glass Nameplate with Brass Holder are the ideal gift for office. 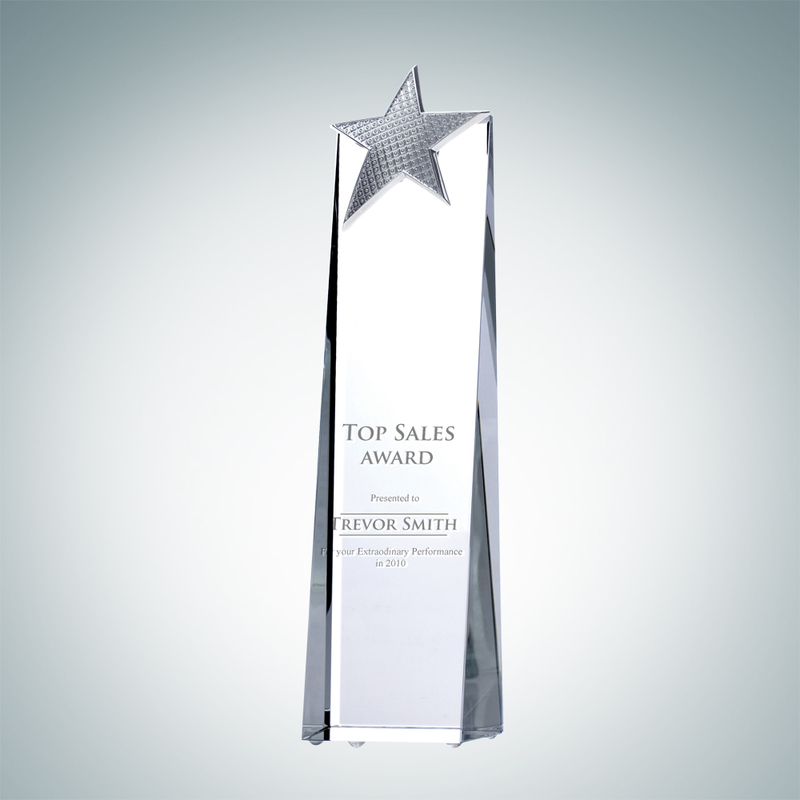 It has a screw on brass square or star of your choice, Available in both Chrome holder and Brass Holder. 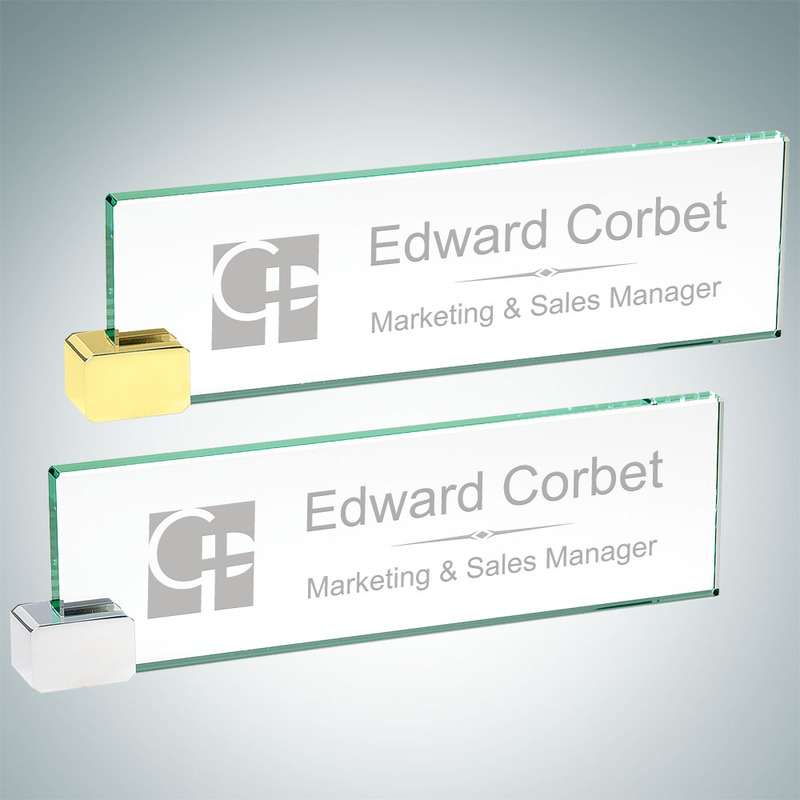 These Jade Glass Arch Name Plate with Aluminum holder have an executive look and feel to them. 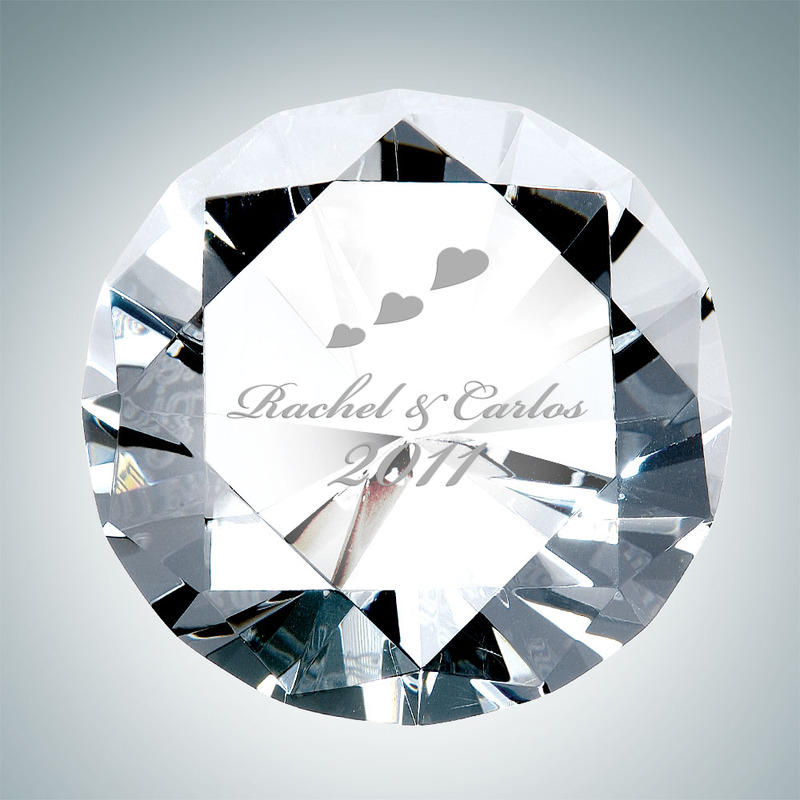 All they are missing is to be personalized with an important persons name. 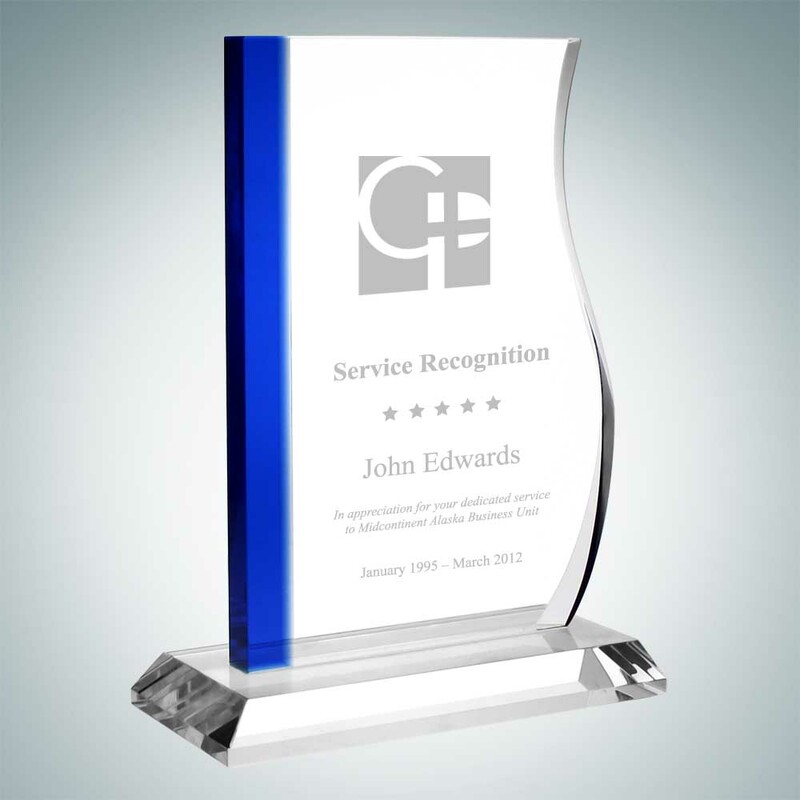 Our glass gifts are an affordable way to recognize achievement and commitment to excellence. Available in two sizes; 3-3/8″ x 11″ x 3″ and 3-7/8″ x 13″ x 3″. 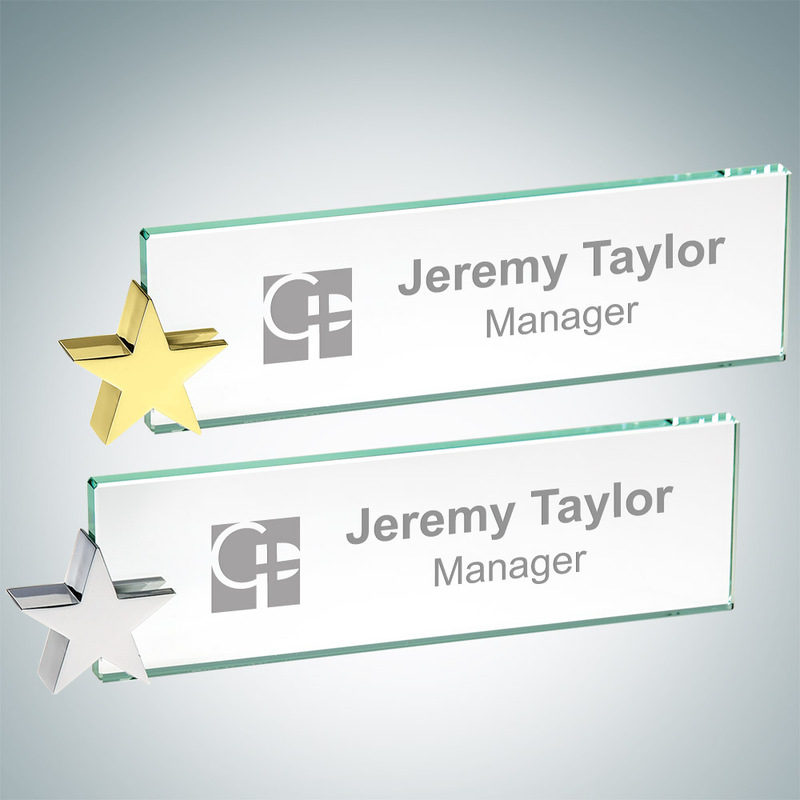 The Jade Glass Slant Beveled Name Plates are made to stand out and be noticeable. 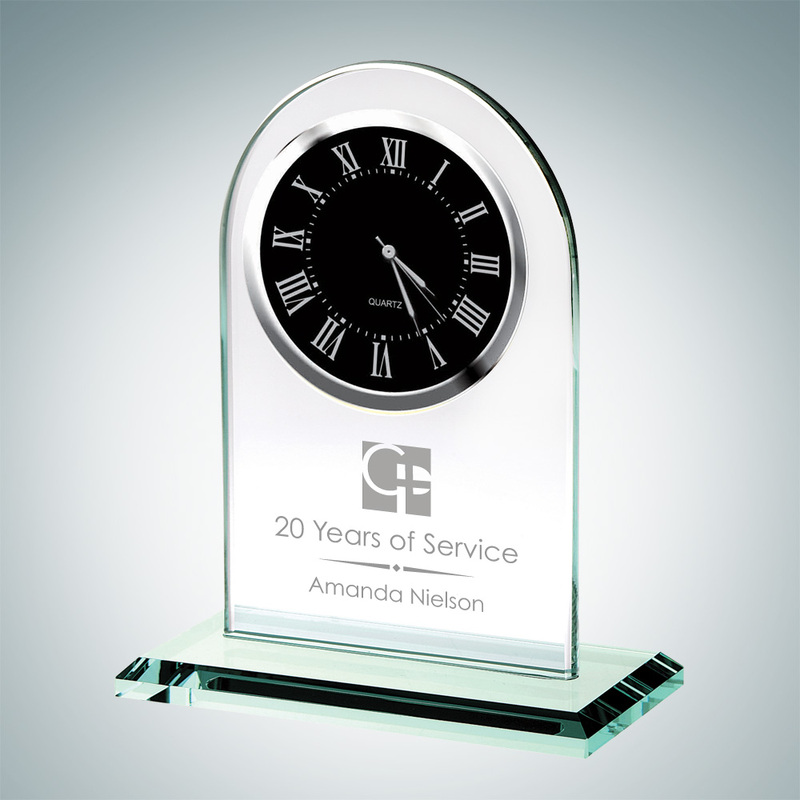 This personalized jade glass gift will be appreciated time and time again. 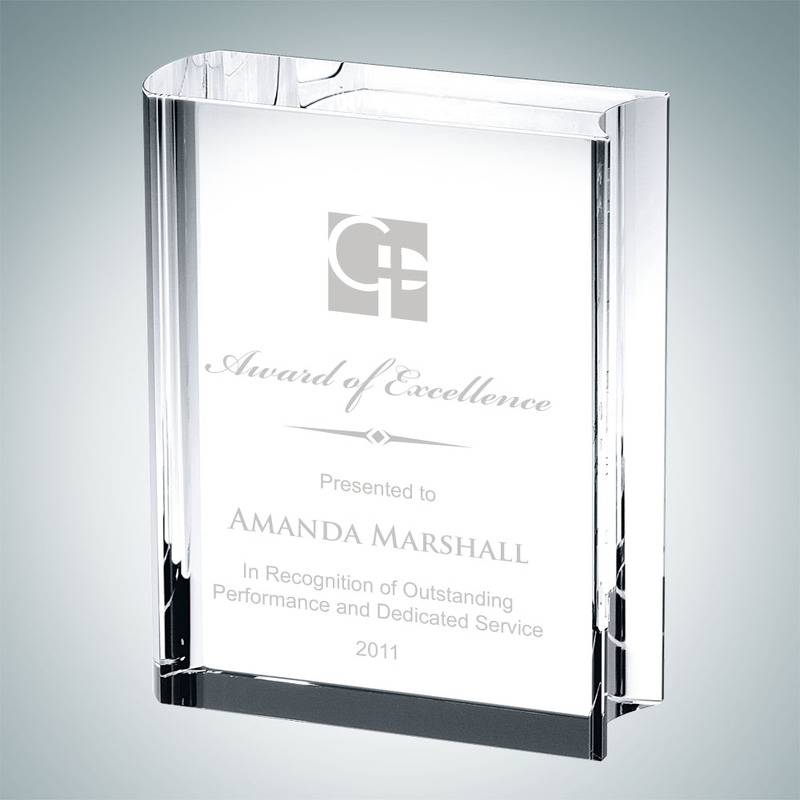 Our glass gifts are an affordable way to recognize achievement and commitment to excellence.. 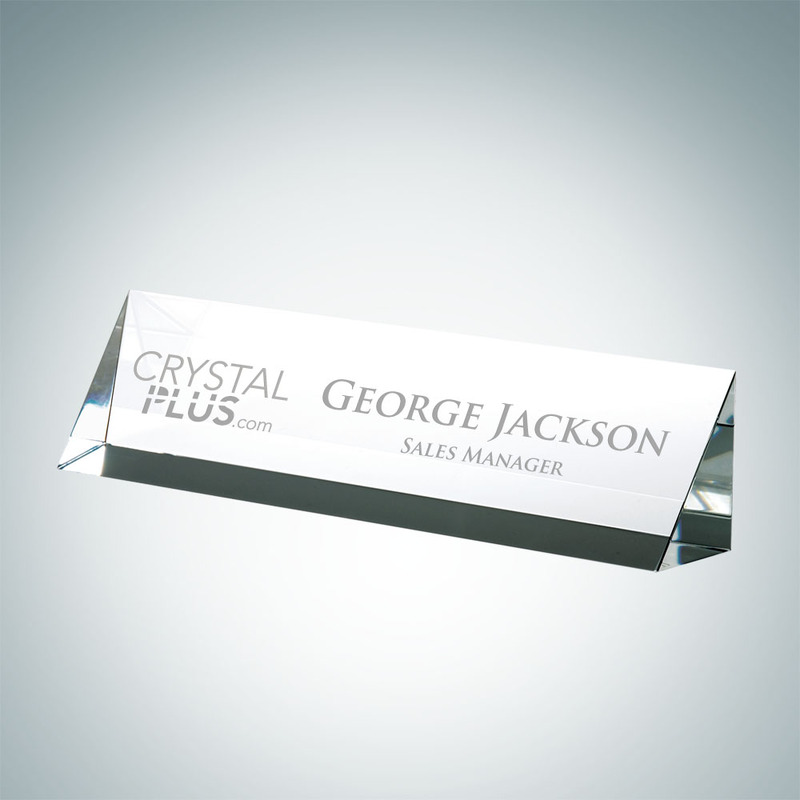 The Optical Crystal Name Plate completes any desk. 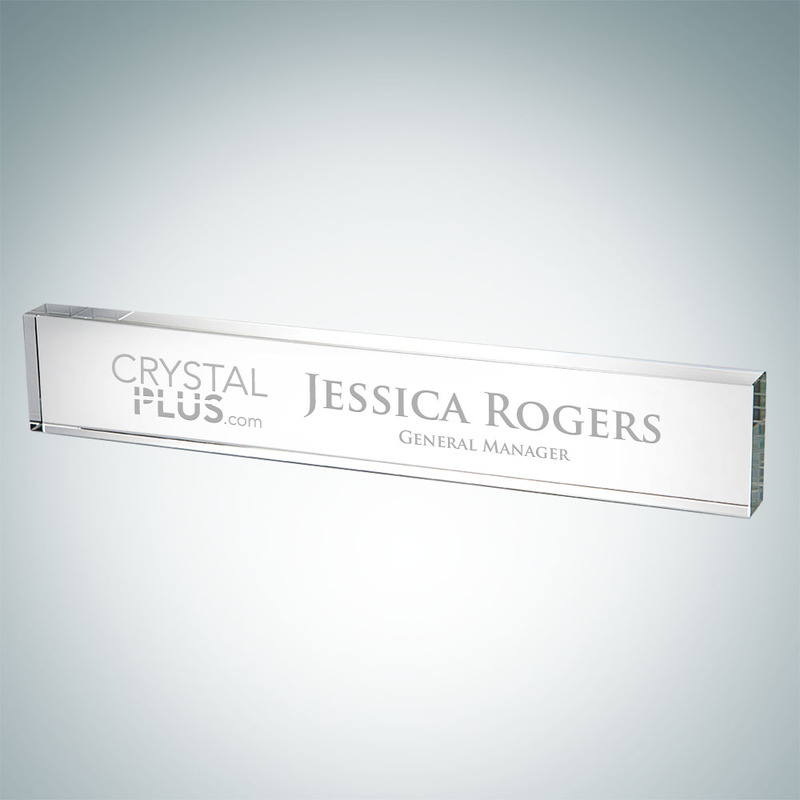 Display your name proudly by sand etching into this optical crystal nameplate. Available in two sizes; 2″ x 8″ x 1-1/8″ and 3″ x 10″ x 1-1/2″. 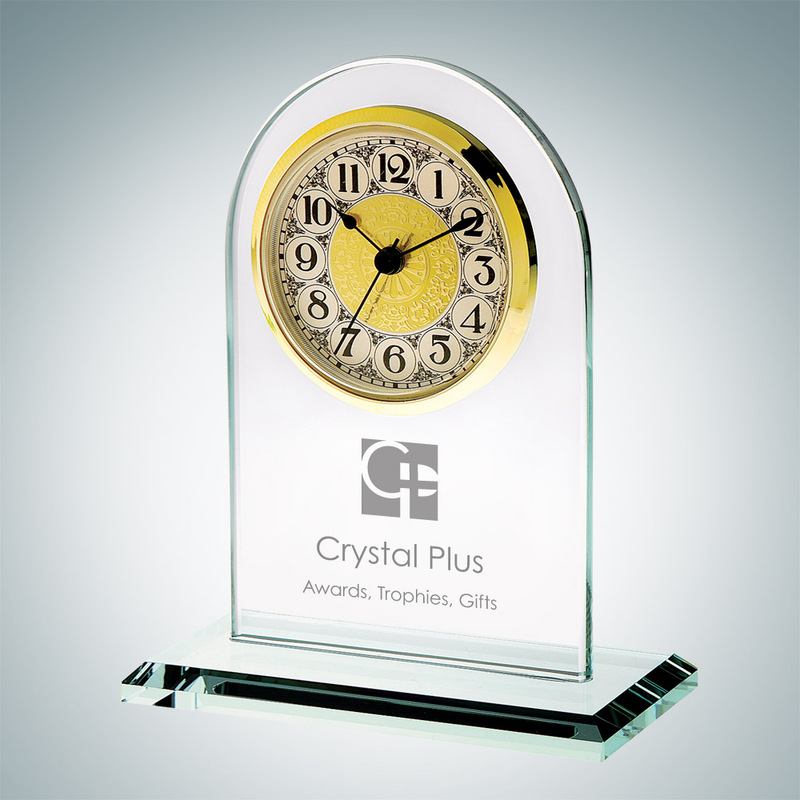 The Jade Glass Arch Clock is perfect for those searching for an elegant and quality black roman numeral faced clock. 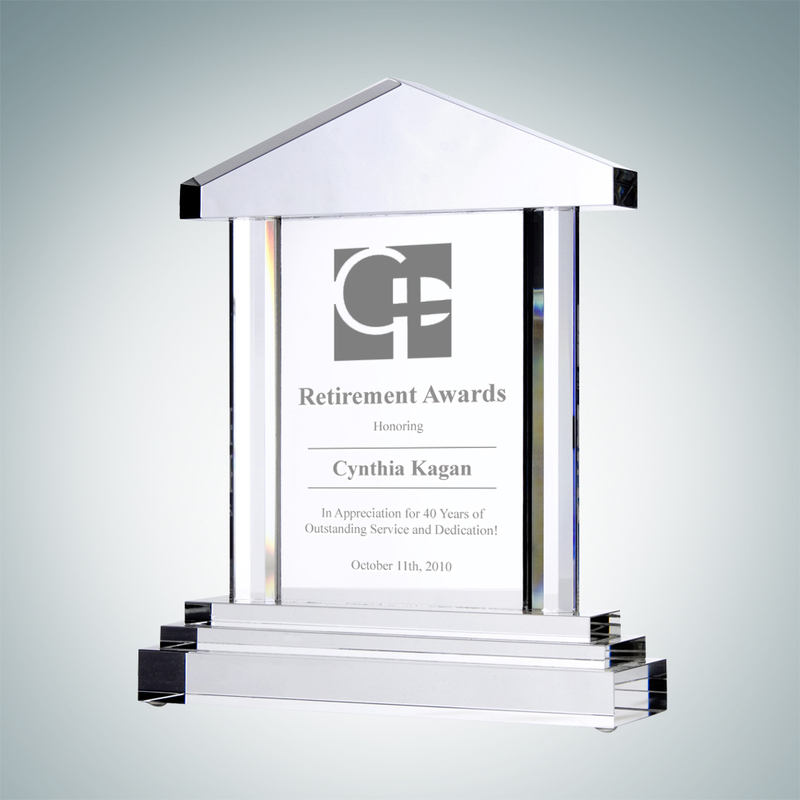 Our glass gifts are an affordable way to recognize achievement and commitment to excellence.. 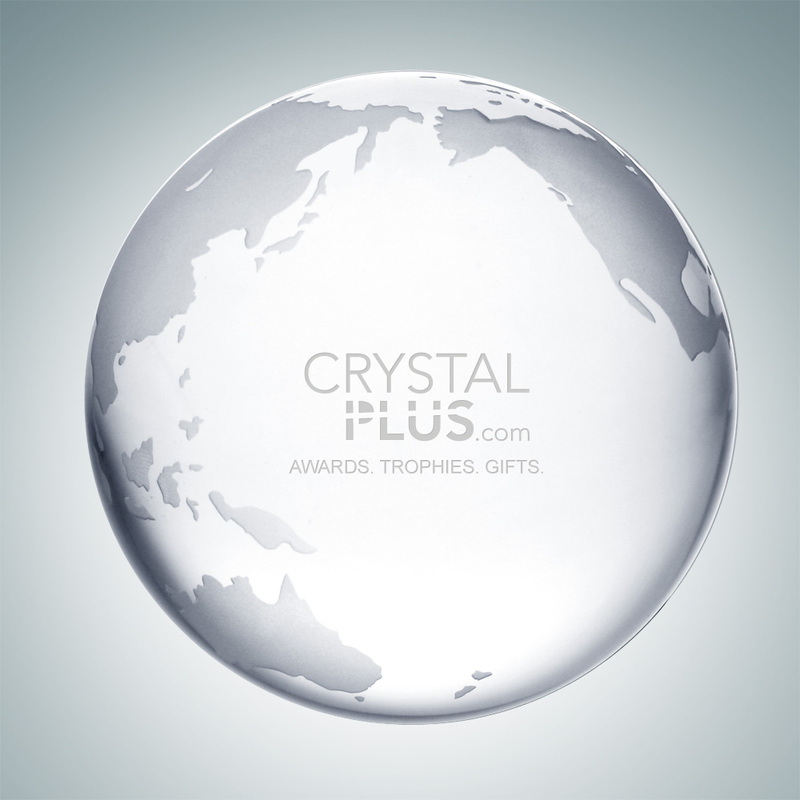 The Optic Crystal Royal Palace Award is carefully hand polished, made with high quality materials and craftsmanship. 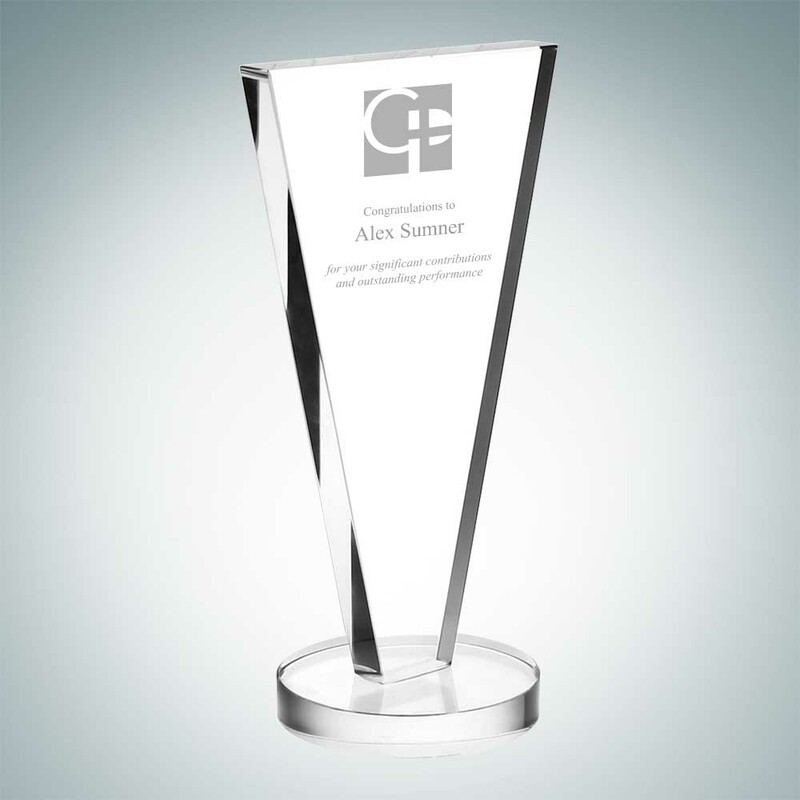 Recognize these individuals with an award that represents their commitment to success.. 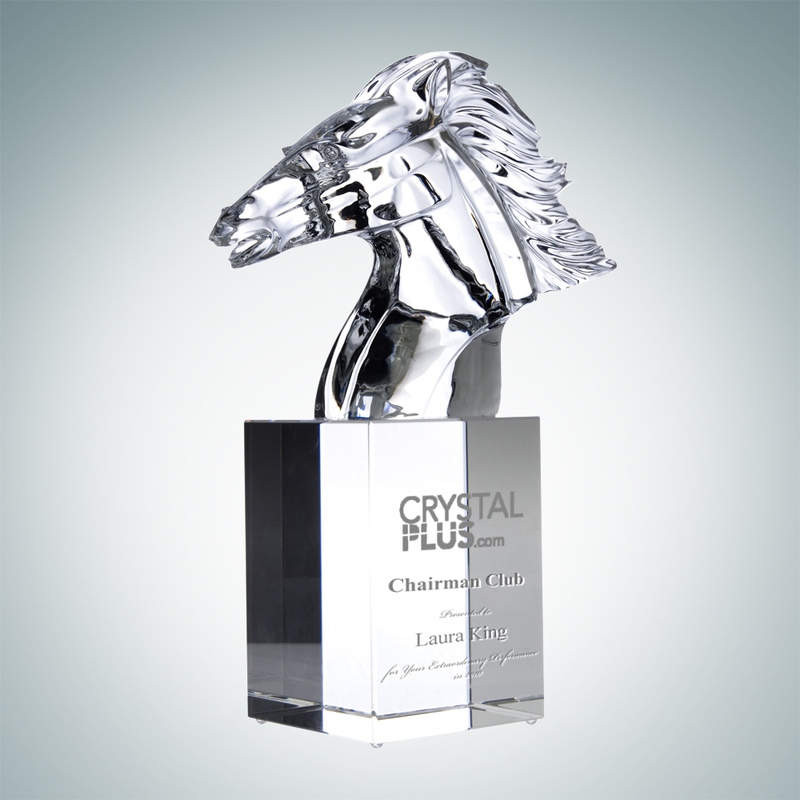 This Optic Crystal Faming Horse is one of a kind that is specially hand sculptured with optic crystal to give it a prominent, unique recognition look that will last for decades. 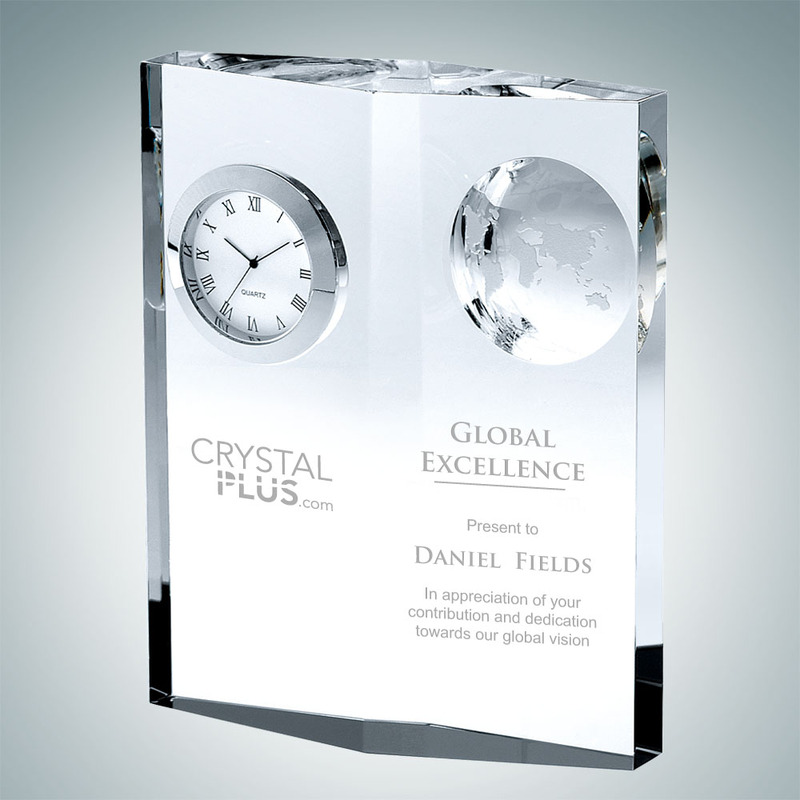 This crystal award will give recipients gratification for their day to day hard work and winning dedication towards achieving greatness.. 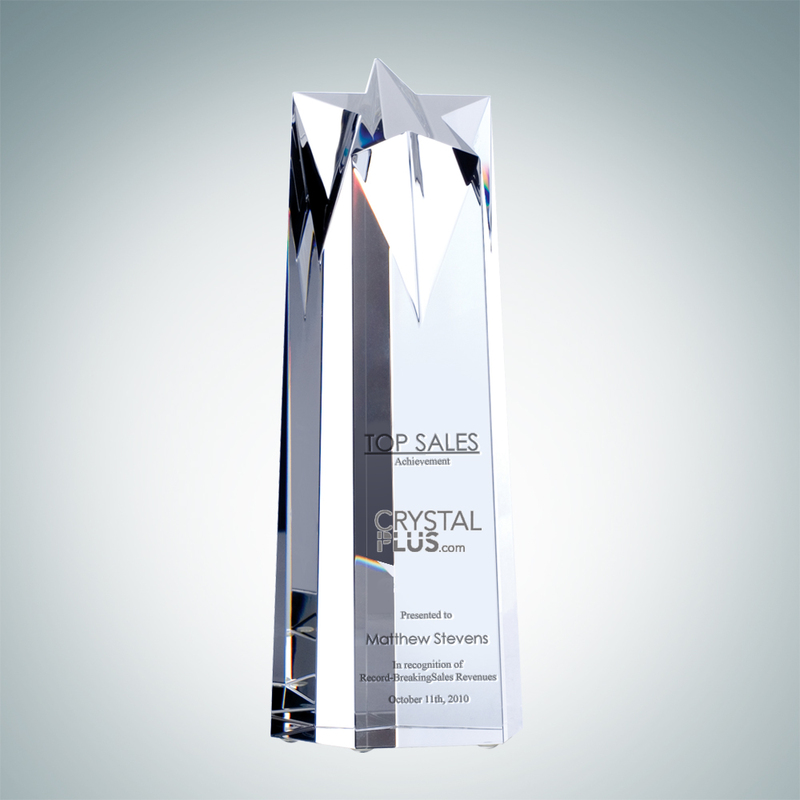 Magnificent tower of optical crystal topped off by of cut star. 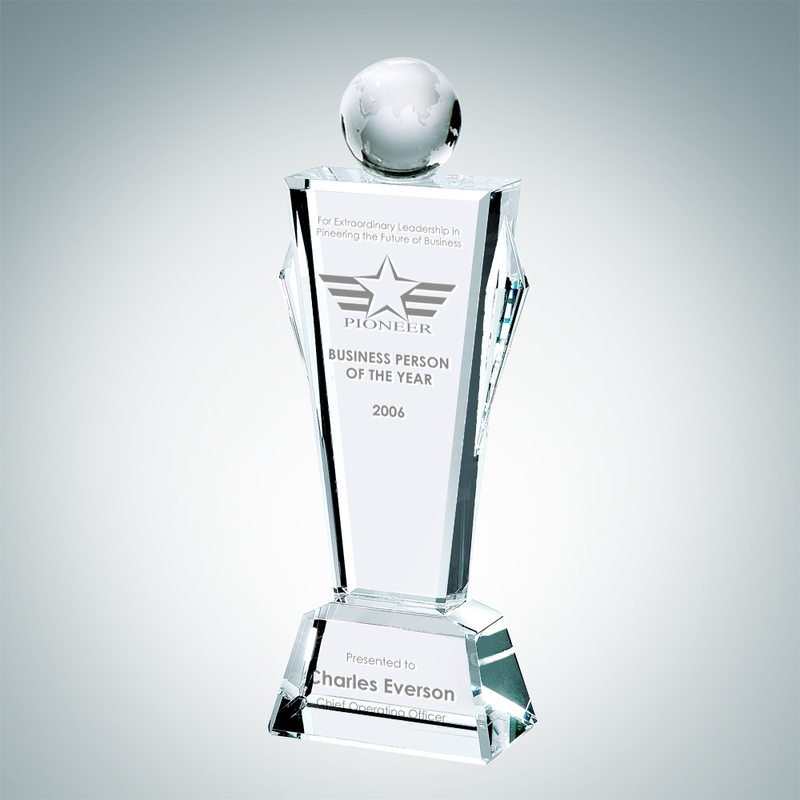 This star tower award is simply huge. 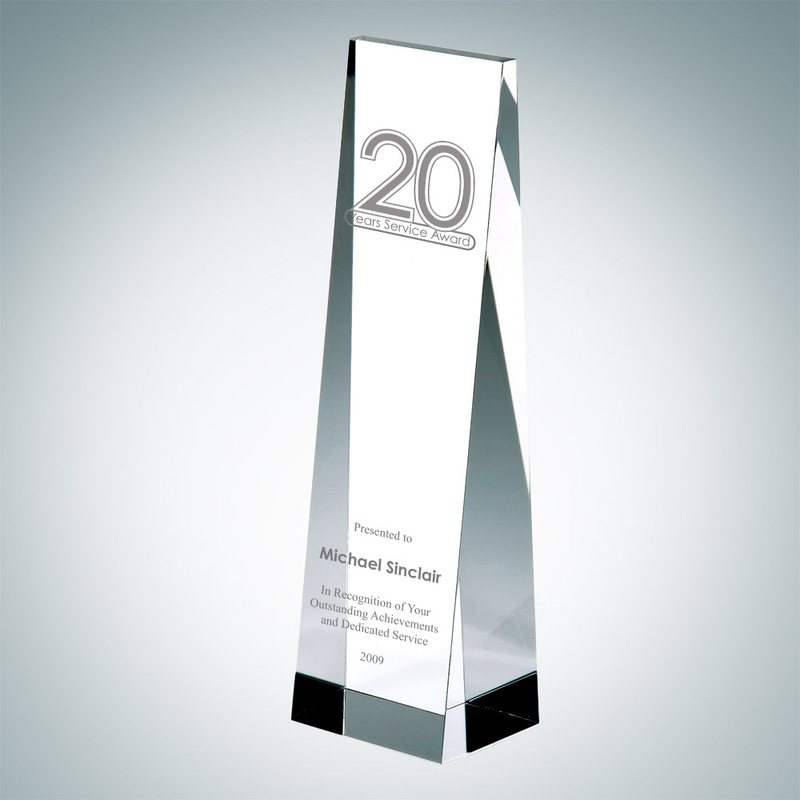 Available in three sizes, the size measures at 10″, 12″, and 14″ tall.. 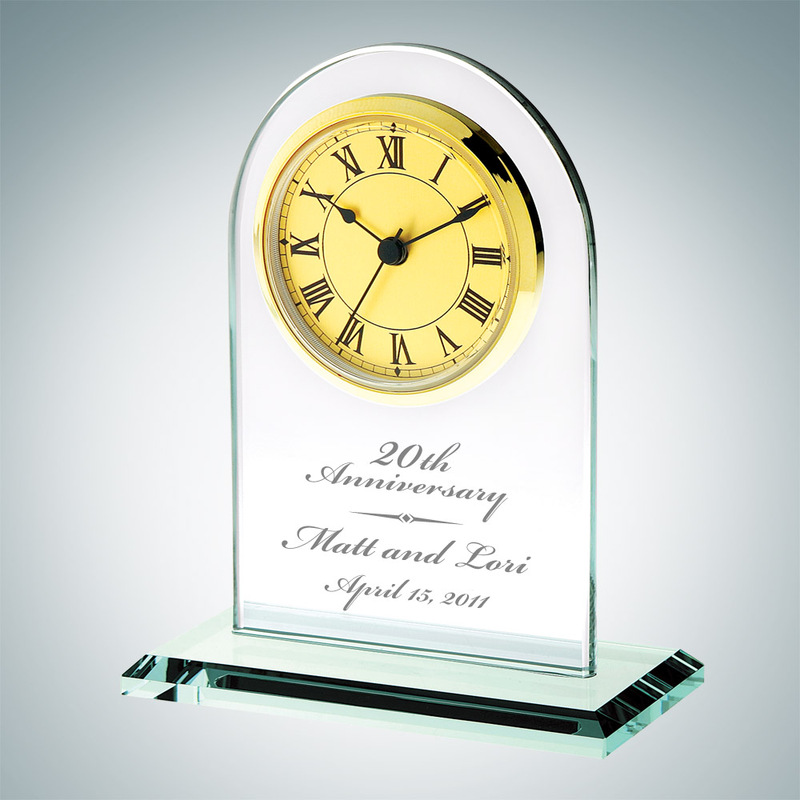 The Jade Glass Arch Clock is perfect for those searching for an elegant and quality roman numeral faced clock. 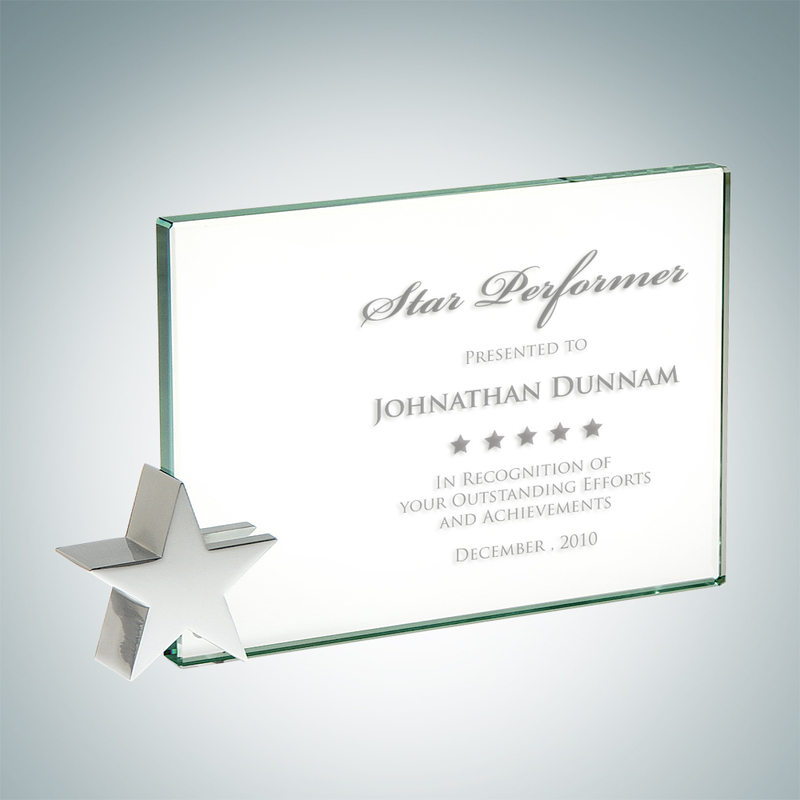 Our glass gifts are an affordable way to recognize achievement and commitment to excellence..